In our household, as in most, I imagine, duties are split between the adults via some combination of availability, willingness and necessity. While I do scrub a mean toilet, skill rarely has anything to do with the divvying. The exception is mealtimes. By far, it is my husband who is the chef of the house. This is a testament of his discerning palate, understanding of flavor and the patience to chop (evenly!) and coax (on simmer!) flavors out of whatever happens to be taking up space in the pantry. He’s so good, in fact, that before tasting anything new (and therefore, suspect) at the dinner table, our son will ask, unabashed, “Mama, did you or Da cook this?” Truly. Of course, everyone has their food preferences and the caveat here is if I’m craving something my husband just doesn’t dig, then I am on my own. And one food I am decidedly flying solo with is anything winter squash. How I love those knobbly, weighty, funky members of the Cucurbita genus. From butternut to delicata, from blue Hubbard to acorn, if it’s a squash, I’m in. Winter squash is actually a bit of a misnomer – these beauties are harvested in the fall but will keep well throughout the colder months, assuming the flesh is unbruised and they are stored in a cool dry place (50-55 degrees F; a root cellar’s ideal, but a garage or other outbuilding would suffice.) Packed full of vitamins A, C and E, along with potassium, fiber and folic acid, their bright sunset hues offer a welcome burst of color in any dish, especially in the winter months when fresh, seasonal produce is difficult to come by. Taste varies from species to species, but you can generally bet on a subtle sweetness, firm texture and the chameleon ability to take on a variety of flavors. The following recipe is both hearty and flavorful, nutritious and decadent [see page 8]. The savory sausage plays nicely off the subtle sweetness of the squash, the walnuts adding a toothsome crunch. The varieties here are endless – substitute beans and rice for a vegetarian version or throw in tomatoes, green chilies, cheddar and cumin for a southwestern dish; the squash will harmonize alongside whatever dominant flavors you select. 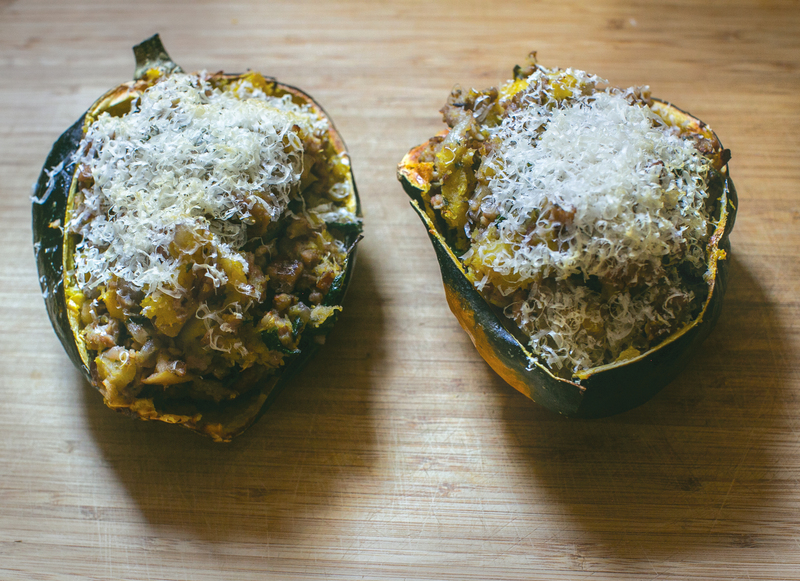 I chose acorn squash for this recipe simply because it’s my favorite. Squash sizes can vary from the cute and teensy single serving to family size, so ingredient quantities will vary, too – don’t be afraid to eyeball amounts and taste as you go. A good acorn squash is unbruised, has good heft for its size and is predominantly green-skinned with flecks of orange – flesh turns tough and fibrous once the skin is completely orange. Oil a large baking sheet. Cut acorn squash in half with a sharp knife (that stem can be tough – don’t give up!) Scoop out seeds, saving for roasting if desired. Season flesh and skin liberally with salt and pepper. Place cut side down on baking sheet and bake for 20 minutes; checking in 10-minute increments thereafter. Squash is done when flesh is easily pierced with fork. While squash is baking, sauté onion on medium heat until translucent. Once translucent, toss in walnuts and apples, season liberally with salt and pepper and cook until walnuts are slightly browned and apples are soft. Add and sauté greens until wilted. Add garlic and cook 30 to 60 seconds until fragrant. Turn up heat to medium high, clear a well in middle of pan and add sausage, spices and more salt and pepper. If you are feeling fancy, add the butter here (I urge you to feel fancy). Stir until sausage is browned and almost fully cooked. Incorporate rest of ingredients and remove from heat.